We don’t usually do the whole franchise thing, but we pulled into a little bbq place we had never heard about, and it looked deserted. Not today deserted, long time deserted. 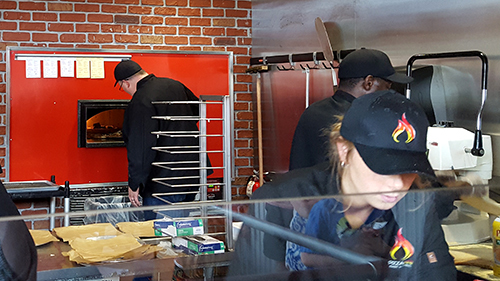 So, on a tight schedule, we shot up the street to a quick-service/made to order pizza place. The place is busy, but still fast. It’s a Chipotle style service. 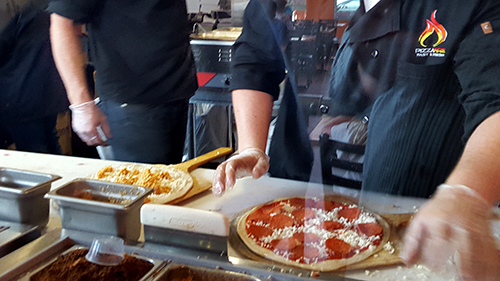 Stroll the counter and point out what you want on the dough that is pressed then stretched by hand. 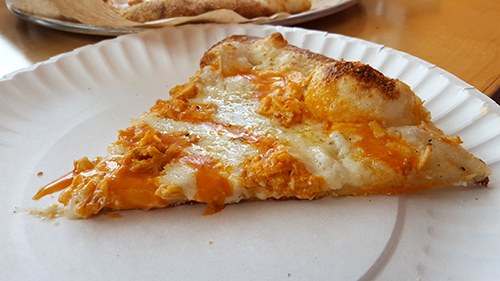 You pick a sauce (of 6), cheese (of 5) and then toppings (of 40). It goes in the oven and 180 seconds later, viola pizza. We are first timers, so we went with a couple of their pre-designed pies and a couple extras. 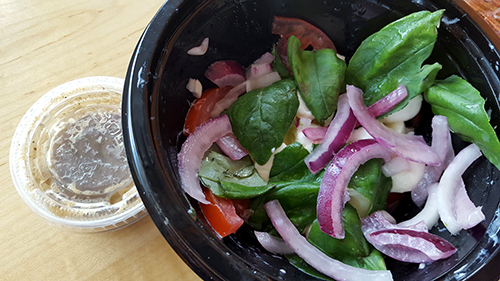 The first extra was the Caprese Salad, tomatoes, little nuggets of Mozzarella, basil, onions and we went with balsamic vinaigrette. The bowl was more than half empty beneath the big freshness sticker on top, which was odd as they certainly didn’t skimp on the cheese, more cheese than anything else. The dressing was actually nice and sharp. 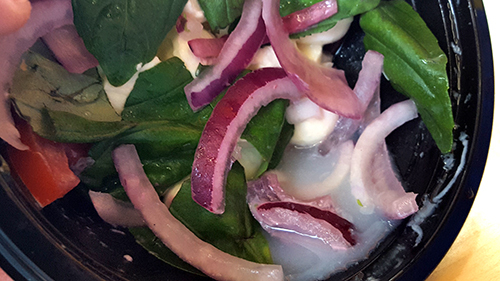 The serious problem with the whole ordeal was the quarter cup of milky looking water at the bottom of the bowl. Not sure where it leeched from, but it certainly wasn’t appetizing and didn’t help the “freshness” of the few basil leaves in the salad. We also tried what is apparently a new addition to the appetizer menu, the meatballs. 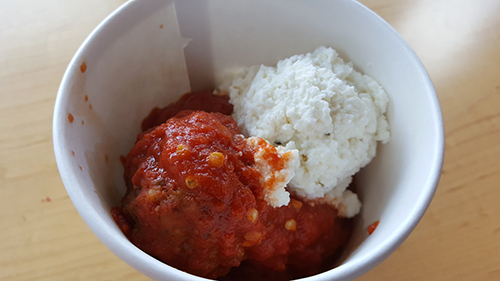 Three are served with a little scoop of ricotta cheese and their regular or spicy sauce. We went with spicy. They must have worked the grind to death to get the almost superball-like denseness these orbs displayed. 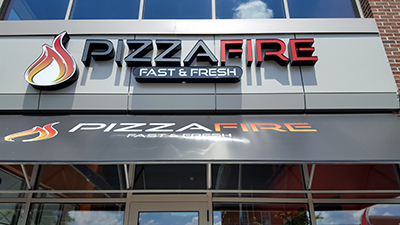 Like the rest of the fiery pizza, there was good and bad about everything. The pizzas were the Chicago and the Buffalo. Overall, both were pretty good. 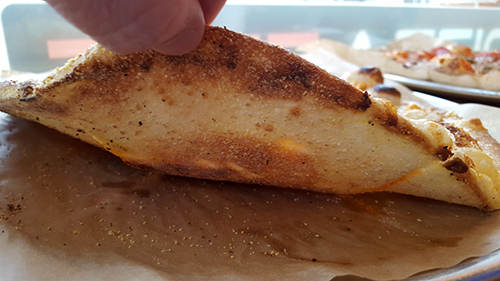 The crust had an impressive maturity in flavor and took on a nice crispy texture around the circumference but didn’t quite set in the middle, which resulted in a floppy point flailing and failing to support the rest of the ingredients. 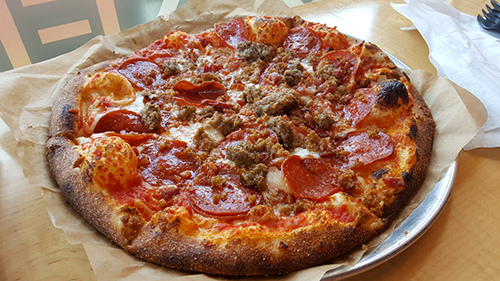 The Chicago starts with a Neapolitan sauce and it meatified with pepperoni, sausage, meatballs and bacon. 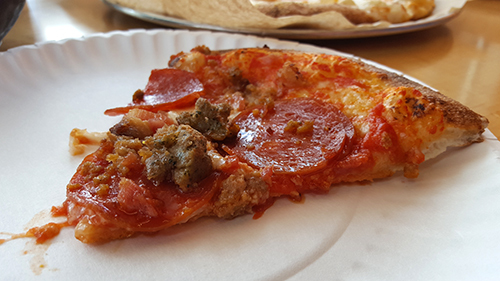 The pepperoni had a piquant bite but the other three meats (especially the sausage) added protein and fat but not much taste. 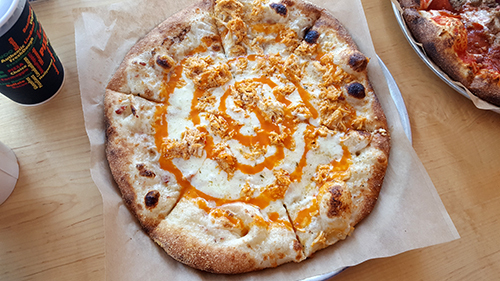 The Buffalo started with a ranch/bacon sauce followed by chicken, mozzarella and romano cheeses and finished with an orange swirl of buffalo sauce. Outside of the floppy crust all of the ingredients contributed what you might expect. 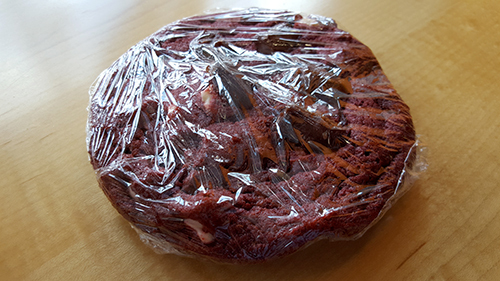 They had a couple different cookies, the red velvet of which caught our fancy. Chocolaty red dough, loaded with chocolate chunks of various shades, and nicely moist without being greasy, not a single complaint there. True, it’s not Ray’s or Uno’s or Spago’s but they do churn out a fair product, of your design, in a stunning time. The next time our plans go belly up, we may return.